RatedDishes allows you to keep an ‘eating-out’ journal and share your food opinions for individual dishes served at restaurants in the UK. It is a fully-searchable (and colourful!) database of dishes, annotated with people’s ratings and comments. Over time, we hope that it will become the canonical guide to restaurants in the UK. 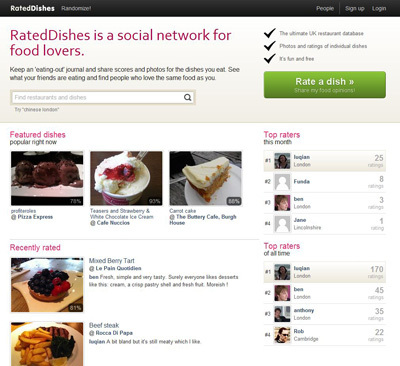 RatedDishes has a narrow focus: pictures and ratings of individual dishes. It is the research tool if you’re about to go out for dinner !